July 11 is an auspicious day in my calendar. July 11, 2012 marks a milestone in my career as a photographer. Thirty five years ago on a sweltering summer day I entered the federal office building in Manchester, NH a civilian and emerged a few hours a freshly inducted private in the Army. On that day I began my journey to becoming a professorial photographer by volunteering for a four-year enlistment. I was to become an 84 Bravo, in Army speak. (MOS 84-B = Military Occupation Specialty STILL PHOTOGRAPHIC SPECIALIST). This photo was made very early in my photography career (1978). 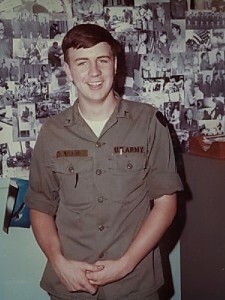 At the time of this shot I had just graduated from the US Army still photographic specialist training school at Lowry Air Force Base in Aurora, Co. This was my first photography job! I was attached to the Public Affairs office at Fort Rucker, AL which was the home of Army aviation training. The wall behind me covered with copies of the press photos that I cranked out of the my tiny darkroom. 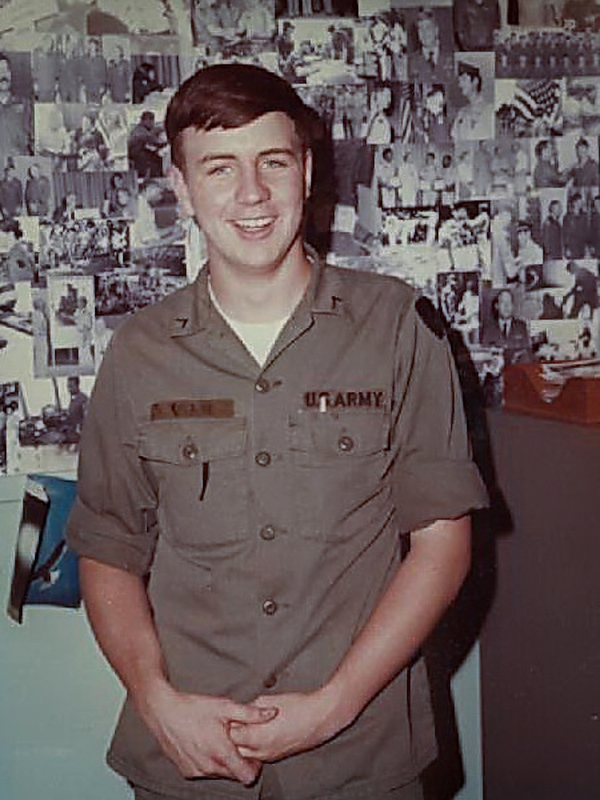 I spent the summer of 1977 in basic training at Fort Leonard Wood in the heart of the Ozark mountains in Missouri. This experience looms large in my memory . I was a goofy 17-year-old kid from NH who suddenly found himself in a completely unfamiliar reality. It was a “Dorothy, we aren’t in Kansas any more” sort of epic paradigm shift. I learned how to march, I developed some proficiency with weapons and I discovered that there are all kinds of people in this world. Life has presented few opportunities to show my marching skills but the weapons thing and the insight into human behavior has come in handy. From there Uncle Sam sent me to Lowry Air Force Base in Aurora , Colorado for photography school. To this point in life my academic record could be bets described as erratic. Most of my reports cards contained the full range of letters and the classroom never seemed to contain my wandering brain. This school was different. My teachers were a mix of civilian and active duty military photographers whose experience as combat photographers ran from WWII through Viet Nam. This program was intense and thrilling. This impressive bunch shared their knowledge freely in exchange for performance. Every week we had proficiency tests score 80% and up you get to continue in the program. Score less than 80% and you earn a one way ticket to the infantry,for the remainder of your enlistment. I maintained a 97% test score average for the entire nine month program!The peril that I could spend my four years as an infantryman was a factor, although truth be told, I have never been motivated by threats. What inspired my performance was the passion I witnessed and ultimately embraced for the craft of photography. The photography instructor’s enthusiasm was contagious and they required that I respect this vocation that shaped all of their lives. The lessons they taught, both big and small, have informed my approach to photography every day of my thirty-five years behind the lens. I owe a tremendous debt of gratitude to those men who trained me so well, who shaped my attitude and gave me a life of photography. As I reflect on the passing years and consider my experiences: the miles traveled and most importantly the people I have met due to the camera, the measure of their gift is immeasurable. Happy anniversary to me! This entry was posted in Uncategorized and tagged Dan Splaine Photo educator, Dan Splaine photographer, photographer habits, Test of Time photography, US Army photographer. Bookmark the permalink. Follow any comments here with the RSS feed for this post. Both comments and trackbacks are currently closed. What a nice story! You have a talent for writing, in addition to photography. You are twice blessed.